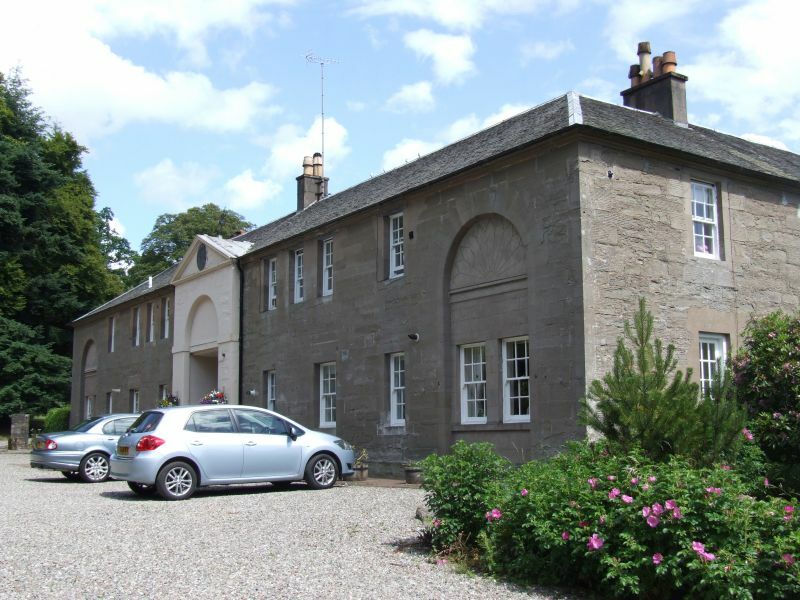 The Stables is an early 19th century 2-storey classical quadrangle with a cobbled courtyard and pump to the centre; it originally functioned as stables, coach house and offices. It was converted, in the later 20th century, to flatted accommodation. Projecting from the NW end of the SW range is the Mews, a row of terraced cottages radically altered and extended in the late 20th century. The Stables are one of the major buildings of the Buchanan Estate. The policies of Buchanan Castle are included in the Inventory of Gardens and Designed Landscapes in Scotland (Vol. 4, 291). The quadrangle is composed of 3 near-symmetrical rectangular-plan ranges of 7 or 8 bays and a 4th range with the principal (NW) entrance elevation. This is of 8 bays, the central bay featuring a round-arched entrance pend with a pediment breaking eaves above, which features a clock (possibly the clock referred to in a cash book entry of 1805-06; SRO GD220/6/52) and a weather vane at the apex. The end bays are emphasised by shallow recessed double-height arches, with patterned render to 1st floor level. The side (SE and NW) and rear (SW) ranges are simpler, with mostly regularly disposed windows and a cavetto eaves cornice. Some ground floor openings were originally doorways, but have had their cills raised to form openings to match the original windows. Inside the courtyard, the SW elevation has stone forestairs rising from either side of the pend to 1st floor doorways at the ends of the range. At each corner of the quadrangle, a concrete porch has been formed, probably in the early 20th century. The courtyard is cobbled, and to the centre is a square-plan ashlar pump with stone troughs at low level. Access to interiors not gained, 2004. Materials: Tooled ashlar to front elevation; squared rubble to side and rear elevations, concrete mortar applied around some window margins. Mostly 12-pane timber sash and case windows. Pitched roof; graded slates. Several corniced ashlar ridge stacks, some rendered.